Another photo that could probably use a caption. Though I’m drawing a blank on those shoes… Taken in the Holmes County Amish settlement. True story … when we lived in Rhode Island, brown eggs were much more available than white eggs. My daughters called them Chocolate Eggs!! They really are beautiful dyed. I’ve used them every Easter for years. Brown eggs are normally the result of chickens referred to as “Rhode Island Reds”. Brown eggs and “shoe” fly pie ! Blue eggs at second farm. It's Blue ... Blue Suede Shoes. You almost stole my thunder there, Roberta. While I am nowhere near being creative enough to come up with a catchy caption, I will ask: if the shoes are brown and they sell brown eggs, do they use white shoes if they are going to sell white eggs? What if they had Araucana chickens? Would they advertise with blue suede shoes? Carl Perkins does the egg business … what a concept! Stephanie Reed. That caption was purfect.Way to go. Get your eggs here, or lose your shoes trying! They have Communists in Rhode Island? Shoes must be a clever attention getter….it got our attention! Take your egg and shoes and Beat It!! Will someone call the family of Shoeless Jo Jackson and tell them I have finally found his shoes please. 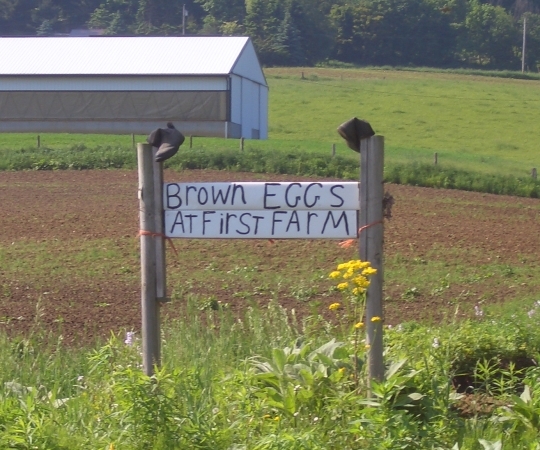 Brown eggs come from lots of varieties of chickens, Rhode Island Reds being only one of them. Some vaieties of white chickens lay brown shell eggs. Can’t imagine what the shoes are for, but I like Richard’s reason. As for brown eggs, I do not like them…I think their yolk is a dark yellow…and I don’t like the yolks in any eggs…..just had an egg sandwich for lunch…but the whites only…..
Our eggs won’t cost you an arm and a leg, but they’re every bit worth a good pair of shoes! You are all too funny. Thanks fo the laughs, you’ve made my day! And the difference between brown eggs and white eggs is? Brown ones are brown and white ones are white. And blue ones or blue. Here are some I bought a while back. Almost too pretty to eat but I did. "Are" blue not "or" blue. Mea culpa. “Are” blue not “or” blue. Mea culpa. Of course the irony back when that jingle was all over TV and Radio in New England, the large egg farm in my town we bought eggs by the baker’s flat as they came off the belt from the coops…sold white eggs. I buy mostly “backyard” eggs now, usually they’re brown. But the color doesn’t really matter, any truly FRESH egg blows away the things they sell in the supermarket! Was there any difference in the taste of the brown, white or blue. Had never seen blue eggs before. I found the place to subscribe again. It is taken care of I hope!!! The shoes on the sign were wet and getting dried in the sun. And blue, brown and white eggs taste the same. My step-grandmother raised quail and peacocks. When I was a child, she and I made omelets from quail and peacock eggs and there was never any difference in taste. I would add that she kept her little step-grandson busy for about an hour cracking tiny quail eggs for his breakfast. Do you folks have any idea how small quail eggs are? I do know. I raised quail for awhile. We did eat a few, but mostly I used the shell,after extracting the egg inside, for crafts. They are near microscopic. I see them in the shops here, almost look like toy eggs. Our eggs are bootiful! We will not be undersoled! Tom G. You may take the prize with that one…. What is the prize Erik? Although he was raised in the city my son Mark has picked up a lot of country ways. One of these is that he has a flock of chickens. I always forget the name of the breed of chickens so I called him and wrote it down. He has Black Austrolorps. They are totally free range chickens. He lets them out in the morning and closes the door on his chicken coop at night. The only problem form me is dodging the chicken poop on his sidewalk with my walker. These chickens lay the nicest brown eggs. The yolks are so rich they are just about orange. He let his chickens set. I really like to see a mama hen walking around followed by five or six of her chicks. One time Mark brought an egg out to me and I could hear the chick peeping inside. It was just about ready to hatch out. That little story, from the poo-dodging walker to the peeping, brough a smile to my face — thanks for sharing, Don! Would you like them on a post? When I was around 5 years old, I went to a neighbor farm house to play. I thought white chickens, white eggs, brown chickens, brown eggs. So why not black chickens, black eggs. In the barn there was something black in a bucket, can’t remember what it was. But I did put two chickens in it. Doesn’t work that way. Won’t even mention the many whippings I got. I am getting this same post four times. Only need to get it once. Can you fix this for me. Don’t want to click on something and delete it completely Thanks for your help. Juanita, is it still occurring with other posts? Might have been a temporary glitch or an email issue. Let me know if it is, but I haven’t heard anything from others so I suspect it may be specific to your situation. Shoo! Shoo-oo! Egg-scuse me! Egg-zit here to egg-sperience the egg-ceptional, egg-cellent, egg-citing henhouse! If you egg-sercise your mind, and egg-samine, brown eggs are not egg-sactly egg-stra egg-spensive or egg-straordinary or egg-stravagant or egg-sotic. Free egg-samples to egg-speriment! Egg-spect them to egg-splode after egg-spiration. Linda, your comments are EGG-ceptional! SO MANY GOOD RESPONSES ! ! Yes Bob, I had missed some of these, I enjoyed them. Well done and thanks for many chuckles folks.